MODEL 1840 HEAVY CAVALRY SABER w/ SCABBARD – 1845 dated AMES –IDENTIFIED TO LTC ROBERT H. GRAY, 22ND NORTH CAROLINA INFANTRY – VERY NICE CONFEDERATE USED SABRE FRESH FROM THE FAMILY: This Model 1840 Heavy Cavalry Saber not only bears the very desirable early date of 1845, a rare survivor of the lot of only 600 Model 1840 Sabres delivered by Ames that year, but more significantly, this sabre belonged to Lieutenant Colonel Robert H. Gray, commanding officer of the 22ND North Carolina Infantry, Confederate States of America. This sabre was recently purchased directly from a descendant of LTC Gray, an elderly gentleman living in East Texas who sadly has no heirs to whom the sabre would pass, and he decided to sell it while he was still alive to attest to the sabre’s provenance. The gentleman stated that this Model 1840 Heavy Cavalry Sabre belonged to LTC Gray, commanding officer of the 22ND North Carolina Infantry, CSA, and that he carried the sabre during the American Civil War. After the war the colonel moved his family to Missouri where he was employed by the University of Missouri. The sabre had passed down through his family from direct descendant to direct descendant, until it came into his possession. As with so many family oral histories, details have a tendency to become confused or blended, and are found to differ from the historical record. While such is the case with the history which accompanied this sabre, fortunately having the right person conducting the research who knew where to look and what to look for, a compelling story of Col. Gray and his family emerged and led to the discovery of period documentation which traced the sabre as well. In fact, LTC Gray was indeed the commanding officer of the 22ND North Carolina Infantry Regiment. In June of 1861, Gray raised a company of Randolph County volunteers named the “Uwharrie Grays”, (aka the Uwharrie Rifles) which became Company L of the 12TH North Carolina Infantry and shortly thereafter Gray was elected as the commanding Captain of the company. Between August and November of 1861 the 12TH Regiment was reorganized as the 22ND North Carolina Infantry. The 22ND was assigned to Seales Brigade, Wilcox’s Division, A.P. Hill’s Corps, Army of Northern Virginia. Soon after the Battle of Seven Pines, James Connor of South Carolina was elected colonel of the regiment and Gray was elected as lieutenant-colonel, the promotions dated June 14, 1862. Conner was severely wounded at Mechanicsville on June 26TH and Gray assumed command of the regiment. Gray distinguished himself in a number of battles, to include Ellison’s Mill, Cold Harbor and Gaines Mill, with his conduct and successes on the field being specifically noted by Generals Pender and A.P. Hill in after action reports, and later in post war unit histories. Gray was suffering from a persistent infection of typhoid fever, and in the late summer of 1862 he was sent home to Randolph County on convalescence leave. Absent for less than sixty days, he returned to his regiment before he was completely recovered and was present for the Battle of Fredericksburg in December. The ensuing battle and the hardships of the winter encampment took its toll, with Gray’s condition continuously worsening and on the March 16, 1863 he succumbed to the disease at Camp Gregg, Virginia. 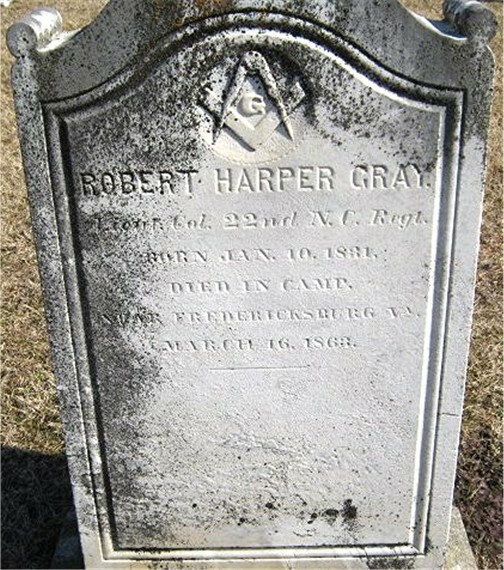 His remains were transported to North Carolina and he was interred at the Hopewell United Methodist Church cemetery in Randolph Co.
Gray was a native of North Carolina, born in Randolph County in 1831 to General Alexander Gray and his second wife, Sarah Harper. The colonel’s willingness to serve his state during the war, and his evident courage and leadership in the field were well founded in his family’s heritage. His father’s rank of general originated with the elder’s command of North Carolina militia during the War of 1812, and his maternal grandfather, Jeduthan Harper’s service as a colonel during the American Revolution. After graduating from Davidson College in 1851, Gray returned home to assume a leadership role on his family’s plantation. He married Martha E. Horney, also of Randolph County, in 1858, and to the couple were born two sons – Alexander Horney Gray in 1858 or 1859, and Robert Harper Gray on June 14, 1861. Many of the Civil War casualties were interred where they fell, immediately after their death. Uncharacteristically the colonel’s remains were not only returned home to his family, but this was arranged immediately following his passing, which undoubtedly served to allay some of his family’s grief, and also served to preserve his personal effects. As a result of an extensive research effort, two key documents were located which explain how the colonel’s sabre survived to be passed to his heirs. The colonel’s brother, Julius A. Gray, served as the executor of his will and the guardian of his two sons. Included in the will (in excess of 90 pages long), is a statement written by Julius that he received from the colonel’s executive officer (and the regiment’s new commanding officer), Major Christopher C. Cole, an accounting of the colonel’s property which had been secured at Camp Gregg. This accounting included a horse, two saddles and a “military bridle”, indicating the colonel was mounted while commanding the 22ND. That Maj. Cole transmitted this inventory to Julius indicates a concerted effort was made to preserve the colonel’s personal campaign equipment for his family. In the process of executing the colonel’s will and settling the estate, Julius prepared an extensive and detailed inventory. 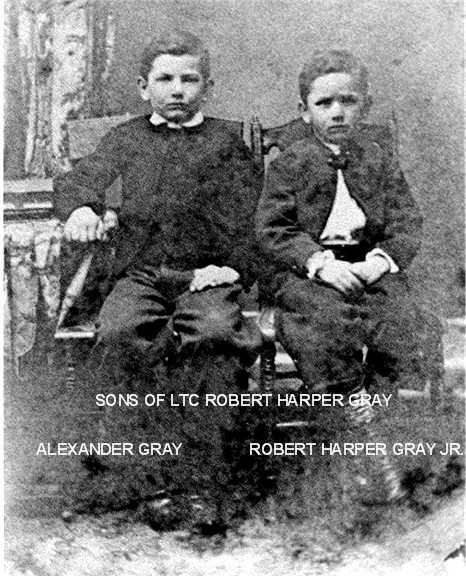 While there were the various accountings of holdings, property, debts and liabilities paid, there is a specific document titled, “Inventory of the Real and Personal property of Alexander and Robert H. Gray, Minors…”, listing the property which was inherited by the two sons upon the passing of their father. In addition to a 300 acre tract and several slaves, the list includes the entry, “one sword”. This is the only “sword” listed in the colonel’s property. The colonel’s military experience was limited to his service with the 22ND and his need for a sword, or sabre, would have been limited to his war service. That only the one sword was listed in his estate is fairly compelling evidence that this Heavy Cavalry Sabre was that very “sword”. In 1868, the colonel’s widow, Martha E. H. Gray, married J.A.C. Brown, a physician, and in the 1870 U.S. Census, the family, including Alexander and Robert H. Gray (Jr.), were recorded living in Dresden, Pettis County, Missouri. The 1880 census lists the family in Sedalia, Missouri, with the two sons still residing with their mother and step father. Martha had three more children with Dr. Brown, continued to live in Pettis County, Missouri, and passed away in 1893. While not much is known of Alexander H. Gray’s life, he apparently remained in Pettis Co. and died there in 1912 at the age of 54. Both mother and son, having preceded the younger son Robert, were interred in the local South Fork Cemetery. Robert H. Gray (Jr.) lived a considerably longer life and left a more detailed record of his accomplishments – some of which account for the family history associated with this sabre. Completing his education at local seminaries and colleges, Robert was gainfully employed as the Pettis County Clerk, in banking in Centralia, Mo., as the manager of at least two manufacturing firms – one in Dallas, Texas and one in Mexico, served as the Postmaster of Boone County, Mo., and was a manager for an insurance company. By 1896, Robert had returned to Columbia, Mo. and married Exie Mitchell of Boone County. It is during this period of Robert’s life that the final piece of the family history of the sabre falls into place. In 1909 Robert became the auditor and accountant for the University of Missouri. As the last living heir to his father’s estate, it is almost a certainty that the sabre had passed to Robert. That he bore the same name as his father explains how the family history combined the elder Robert’s Civil War record with his son’s employment at the university, and the descendants began to believe they were one in the same. 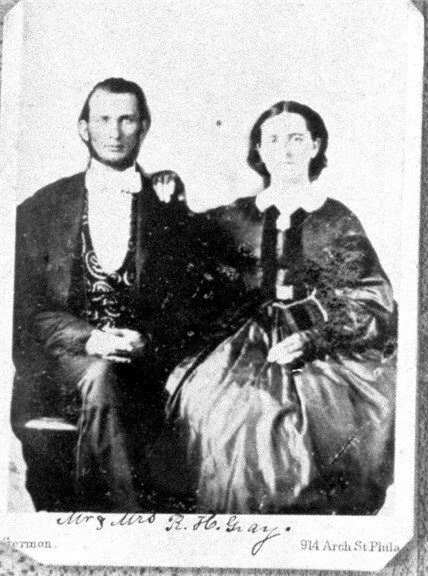 Robert (Jr.) and his wife Exie had two daughters who survived them – Mrs. Thomas W. Parry, Jr., and Francis Mitchell Duvall, both of Missouri. Both women appear to have spent their lives in Missouri. A son, Robert Mitchell Gray was born in 1900, but only lived for six months. How the sabre descended to the family member here in Texas with the history of its origin intact is not known, however there are a number of Duvall’s in that immediate area of Texas and therein may lie the family link. That this sabre was designed for, and intended for use by dragoons does not alone preclude its use by an infantry officer. As with all of the other pieces of uniform, equipment, and weapons, the officers were expected to outfit themselves at their own expense. While there were conventions dictated by the regulations of the period, a considerable amount of latitude was afforded the officer and his preferences and financial situation dictated his choices as much as (if not more so) the regulations. When the war began, the southern states had a considerable amount of military equipment stored in federal arsenals, and the state militias had been receiving regular issues of equipment from federal stocks under the various Militia Acts, so this sabre could very well have been in North Carolina at the outbreak of hostilities. Finally, while the pre-war 1850 regulations called for company grade officers to carry the Foot Officers Sword and Field and Regimental Staff officers were to carry the General Staff Sword, by 1861 Col. H.L. Scott, Inspector General of the Army, observed that mounted officers of Artillery and Infantry were carrying the Mounted Artillery Sabre. The “Instructions for Making Quarterly Returns of Ordnance and Ordnance Stores” dated 1863 included “Sabres, Staff and Field Officers” in the list, indicating sabres were being carried by senior infantry officers. The Confederacy - be it the government or the individual officers - did not have the finances to support the array of sabre options available to the federal officers, but the practicality of carrying a heavy sabre when mounted no doubt occurred to the southern officers as it had to their northern counterparts. For that matter, mounted or afoot, the Heavy Cavalry Sabre would be a far more substantial weapon than the lighter Foot Officer’s Sword. Manufactured by the Ames Sword Company and so marked on the ricasso of the blade with legible stampings as clear as the day they were struck, “N.P. Ames, Cabotville, 1845” and on the reverse. “US" and the inspector's initials "NWP”. The pommel cap is legibly inspected, “WAT” for Capt. William Anderson Thornton and “NWP” for Nahum Patch. The blade surface is very smooth and overall bright and clean, with minor, light scattered discoloration commensurate with the age of this sabre. The edge has two minor nicks on the upper third of the blade, again in character with the age and long service life of this sabre. The nicks are shown below in the photographs – typical of the edge wear that occurred in service and not the result of abuse or mishandling, nor do they detract from the overall appearance of the blade. The tip of the blade has retained the original profile and length. The guard has a very nice naturally aged patina, and is full form with no misshaping or breaks. The grip shows the most wear of any feature of this sabre, suggesting wear and exposure in the field. The majority of the leather covering on the grip is intact, missing a section, two grooves in width on the left side and five grooves on the right side, and confined to the top of the grip where the thumb would rest. The remaining leather is solid and tight on the grip and is lightly crazed. The wire wrap is missing on the majority of the grip, with the last four wraps leading under the pommel cap still intact. The leather washer is present between the blade and the guard. The grip could be easily restored, but in light of the association to LTC Gray and the sabre’s probable use during the war, that decision will be left to a future owner. The scabbard is full form, with a complete throat, both carrying rings, a solid seam with no splits, a drag in the original shape with no excessive wear, and has an overall naturally aged smooth brown color. The upper ring is struck with an inspector's initial signifying the scabbard had been accepted. The surface of the scabbard has a consistent surface with very light pitting, but no heavy corrosion.